2019 IS AN important year for Ireland as the country marks a century since the start of the War of Independence. After a brief lull in commemorations following the centenary of the Easter Rising, there’s a busy few years ahead, right up until 2023 and the end of the Civil War. This period in Irish history was one that left society divided, and over time some details of individual family history may have been lost – sometimes through simply not being spoken about. This is where the Military Service Pensions Collection can prove invaluable. The background to the collection, which is being meticulously sifted through by archivists and published online, is after the revolutionary period those who fought in the conflicts were entitled to pensions. To do this, they had submit supporting documents and testimonies about their activities. The result is a wealth of information – much of it previously unknown – about that period of Irish history. This ranges from a famous chipper’s connection to the 3rd Battalion C Company of the old IRA to 10-year-old dispatch carriers. 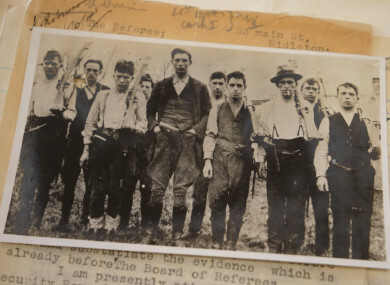 The archivists involved pulled a range of files from the records to show us the level of insight into Irish history the documents give, and to give you a taste of what you might be able to find out about your own family. Email “Fancy researching your family history from the revolutionary period? This is a good place to start...”. Feedback on “Fancy researching your family history from the revolutionary period? This is a good place to start...”.